Bill Schelly has done a wonderful job with The Art of Joe Kubert. 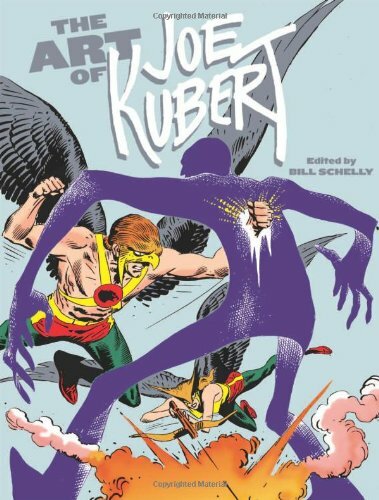 It's a huge coffee table book that looks at Kubert's long illustrious career at drawing comics. Schelly had previously published in 2008 Man of Rock: A Biography of Joe Kubert. This book focuses more on the art, such as influences and style. Joe Kubert's drawing career started in the 30s and he spent over 70 years in comics. Presented in the book is a beautiful retrospect of the different projects he has done, such as Sgt Rock, The Unknown Solder, Tarzan and many more even from obscure companies that he worked for. There aren't a lot of unpublished works as Joe Kubert is quite particular of his personal works. The reproduction of the artworks is great and they are printed big. There's even 50 pages of complete comics from the 40s and 50s that Kubert did. It's a book that's engaging and inspiring to read, especially so if you like Joe Kubert and comics from the past.